KryptonZone Blog: Three Typhoons At Once?! There are currently 3 typhoons hovering around Taiwan. This morning, there were only two, one each on either side of the island. 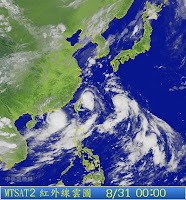 However, a massive tropical depression system was also detected hanging just over Taiwan. Within a few hours, that changed into another typhoon. It isn't the first time this has ever happened, but it is a rather rare, and quite a worrying occurrence. The weather services are predicting buckets of rain to chuck down very soon and all typhoon alerts have gone off to warn everyone on the sea and on land.